So after many years putting it off I have decided to invest in building a decent home lab for testing basically everything VMware related. I spent the past few weeks researching the parts I should get and in the end, and after some help from my colleagues Tai Ratcliff and Askar Kopbayev, I finally settled on the Super Micro X10SDV-6C-TLN4F-O Motherboard as my starting point, as it can hold up to 128 GB RAM (Which is going to be important when spinning up all of the vRealize Suite). I wanted to build a lab that was small, low power, quiet and not ugly (as I live in a small apartment, and it will be on display). Also as I said above, 128 GB RAM is good too, as it means I can basically nest everything onto it (until I can get enough budget to build another node and make a 2-Node vSAN Cluster). The parts added up to about $4000 AUD total, however that is largely in part due to the extra 64 GB RAM (currently for 64 GB RAM it was about $900 AUD). I still chose the disks in preparation for deploying a vSAN cluster, with it being a single node vSAN cluster for now. 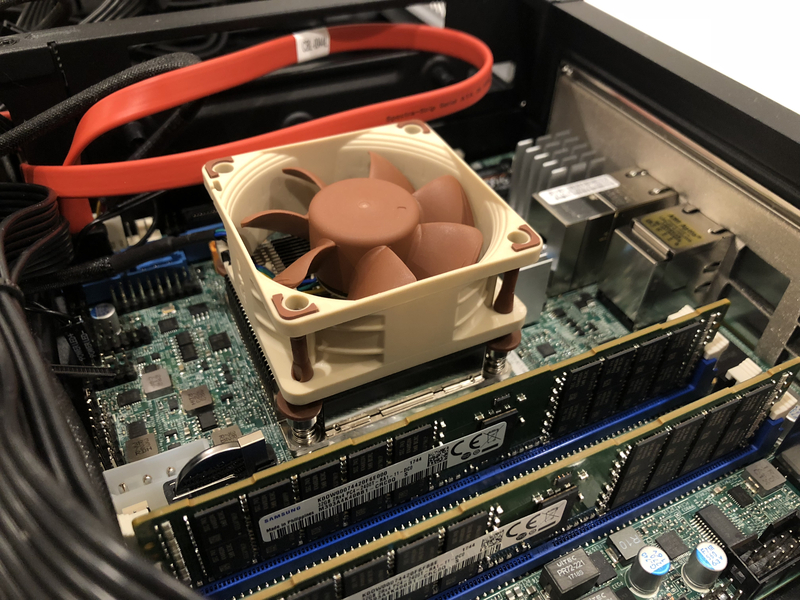 Motherboard: SuperMicro X10SDV-6C-TLN4F-O (Not the “+” model, as I did not want the CPU Fan, as I bought a noctua one below instead as it is much quieter). 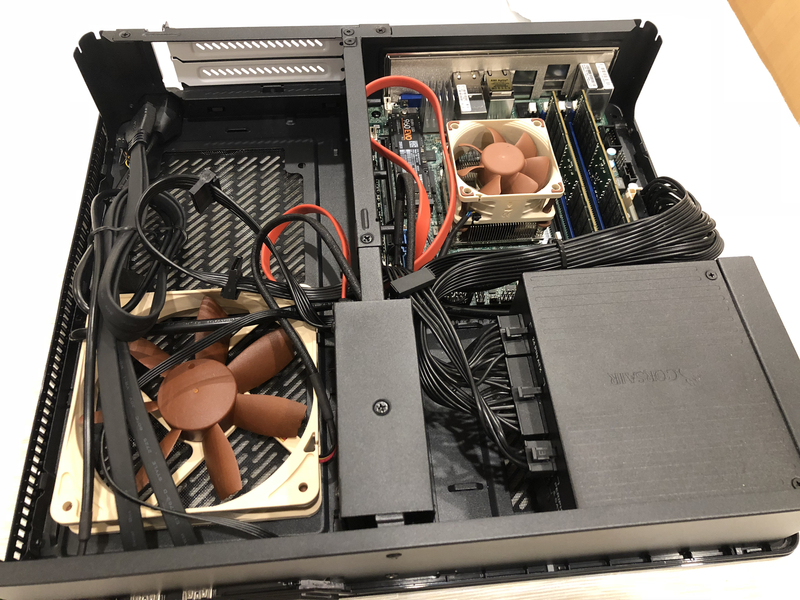 Case Fan: Noctua NF-S12B – I’m not entirely happy with the fans current location (see image below), it is located in the case to blow the hot air out of the compartment where the GPU sits, however there is no GPU. The compartments are linked via a gap, so its better than not having any fan at all. I will be keeping an eye on it. PSU: Corsair SF450 450W 80 Plus Gold Full Modular SFX Power Supply (This isn’t on the Corsair site any longer, however their SFX 600W will also do the trick). RAM: 4 x Samsung M393A4K40BB1-CRC 32GB DDR4-2400 LP ECC Reg Server Memory – 128 GB RAM total (only 2 sticks were delivered in time for my pictures taken below). From a build perspective it was a pretty straight forward PC build into the Fractal Design case. With the CPU fan, as it didn’t attach to the heat sink on the mobo, I just installed the rubber screws and rested it onto the heat sink as I found the guys at STH did here. The fan still stays there even when putting the case vertical, however I’ve decided to keep the case horizontal for now as it looks better in my TV bench that way anyway, and I feel like it could fall off the heat sink pretty easily. 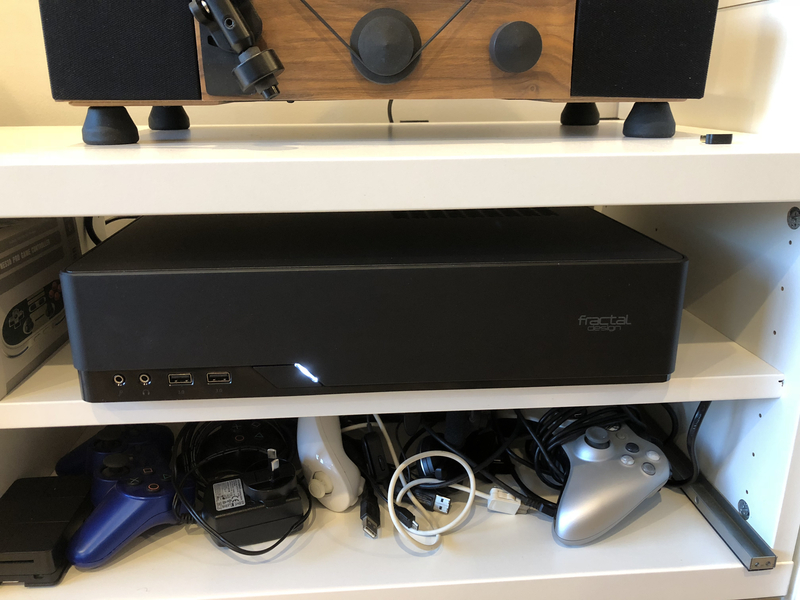 Nice and neat under my TV bench. The other stuff underneath…not so much. Next up, the vSphere 6.7 install!